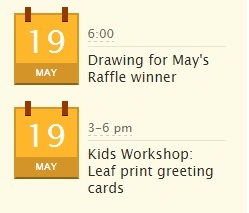 Join us tomorrow as we make greeting cards marked with leaf prints for our kids workshop. We will explore different ways to make leaf prints using markers, crayons and pencils. Don’t forget to get entered into our May Raffle for your chance to win up to $50 good at any and all PFM vendors. Raffle tickets are $1 each or 6 for $5. Drawing will take place a 6:00. You do not have to be present to win. Winners will be announced on Facebook and next weeks newsletter. Be sure to stay tuned! Sunny Slope Greenhouses is back and will be at the market with tomatoes and cucumbers. Granite Springs Farm is coming to market with Cabbage, Broccoli, Rainbow Swiss Chard, Romaine Lettuce, Buttercrunch Lettuce, Spinach, Cilantro, Basil, Kale, Golden Beets and maybe a few cucumbers! Fiddlehead Farm will have jams, hot sauces and granola, seasoning salts and LOTS of local strawberry jam! Lilly Den Farm with beef, pork, chicken, veal, goat, chicken eggs, duck eggs, pet products and compost. Red Root Farm will be at market this week with Swiss chard, magenta summercrisp lettuce, red and green kale, bok choy, green onions, fresh herbs (parsley, dill, mint), and variety of garden transplants. Owl Licks Soap Co with a great variety of naturally made soaps and lip balms. Hargrove Family Farm with chicken eggs, pork, and seasonal vegetables. Lu’s Farm will be at market. We will be selling more plants. We will be bringing some new ones this week. Tomatillos, sugar baby. Watermelon, and cucumber along with a bunch of great herbs. We will also be bringing our baked rolls & our hand pies. Catch us on Facebook and follow our daily adventures on the farm. Gramma D’s Cookies will be at market on Thursday with cookies, cakes, brownies, pecan squares, lemon squares, apple dumplings, ooey-gooey pound cake and cheese cakes! See you real soon!! Solstice Herb Farm with fresh herbs and an amazing variety natural beauty products. Backyard Edibles with a wide variety of vegetable and herb transplants. Silk Hope Organics with lettuce, cabbage and potatoes. Kenneth Beal’s Farm with a wide variety of spring vegetables. Gray Thomas Farm with greenhouse tomatoes, strawberries, greenhouse cucumbers, strawberries, asparagus, jams, sauces and other spring treats. Donna Kay’s will be there Thursday with fresh baked sour dough, pound cakes and French Baguettes.